This add-in is installed for all users on this computer and can only be connected or disconnected by an administrator. Trying to remove an add-in that was installed using the option “All users” will result in this error message. If the add-in was installed for the current user this message will not appear. When you install software, the screen may have an option to install it for the current user or for all users of the computer as is shown on this screenshot. Most users click Next without paying much attention to this screen (using the default set by the developer), or set it for "All users" so the add-ins works for all Windows accounts. 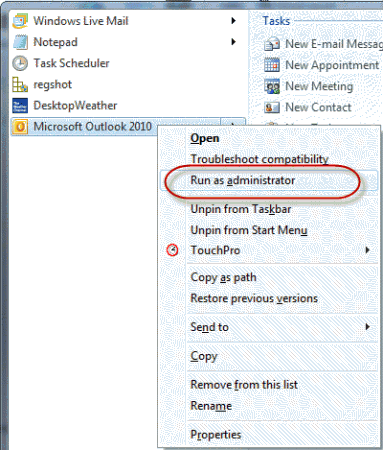 Close Outlook and restart it using Run as Administrator then remove the add-in. Close Outlook and restart Outlook normally when finished. To Run as Administrator, right-click on outlook.exe or the Outlook shortcut and choose Run as Administrator. If Run as Administrator is not listed, hold Ctrl+Shift+Alt as you right-click on the shortcut to show the full menu. This was just what I needed help on. Unfortunately didn't work. Windows 10 Pro with Outlook 2016. I started Outlook with Run as Administrator and still got the message about not being able to make changes. I'm totally lost here. Why would that not have worked????? Was it the exact same message? Can we search information in this website? I didn't find the search icon here. The articles here are really useful. There is a search box in the left sidebar. On mobile devices (or narrow screens) it will be near the bottom of the page. Thank you very much wonderfully it worked. Again thank you. If the above mentioned solution didn't work, you can click on "windows button" to open the start menu. And write "winword /safe" while on the menu. Then right click on "Microsoft Word - Run command" and click on "Run as administrator". The only difference is that you run Word in "Safe Mode". running word in Safe mode won't help you if Outlook addins are the problem. What do you do if Outlook 2016 won't open as administrator on 5 separate systems? This is pro plus installed via office 365.
sorry i missed this earlier. What happens when you try to open it? Just press shift right click for the "run as admin" option.